Seattle, WA - Seattle is in the top 5 rainiest U.S. cities by number of precipitations days, and it gets the least amount of annual sunlight of all major cities in the lower-48 states. This city experiences moderate to heavy rainfall during the months of November, December, and January and this last winter was officially our wettest rainy season ever, with 38.22 inches of rain from Oct. 1st to March 1st, just a hair over the 1998-1999 record of 38.19, but about 13 inches above average. His Grace arrived to Seattle on Friday, March 11th, accompanied by Protopresbyter Stavrophor Lazar Vasiljevic. They were greeted at the airport by Fr. Predrag Bojovic. After arriving at Fr. Predrag’s residence, His Grace and Prota Lazar were greeted by Fr. Predrag’s family and Milan Stefanovic (current president of the local Church Executive Board) and his family, and then they all spent an evening in spiritually rewarding talks, enjoying a delicious dinner prepared by Presbytera Rada. On Saturday morning, His Grace officiated the Divine Liturgy at the local parish dedicated to the Protection of the Most Holy Theotokos, with a Eucharist that everyone in attendance will long remember. The parish priest, Fr. Seraphim Gascoine, along with altar boys and numerous pious parishioners, met the Bishop at the front doors and followed him into the church. His Grace moved from the crisp, sunny morning (first one after many days of heavy rain) into a brightly lit church with the voices of a choir filling the air. 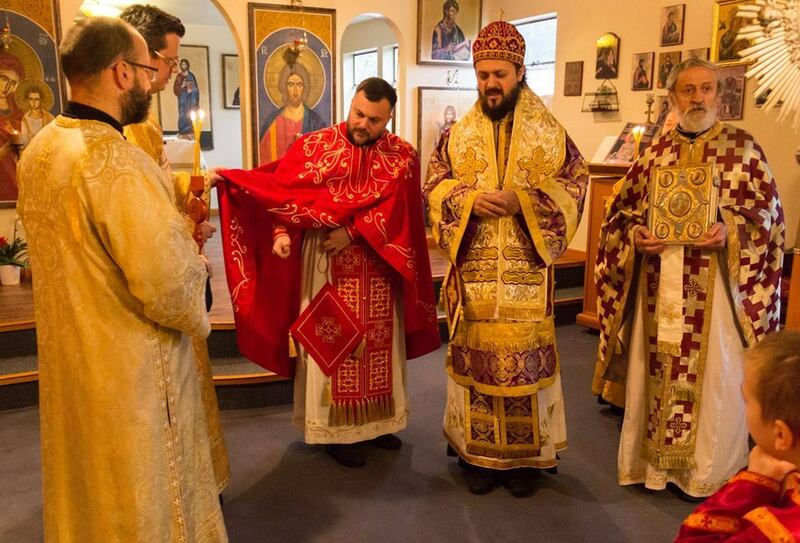 After the Bishop’s vesting, His Grace presided over The Divine Liturgy concelebrated by Fr. Seraphim, Fr. Lazar Vasiljevic, Fr. Predrag Bojovic, and the blessed Synaxis of the faithful (around 40), of whom many communed in the Cup of Eternal Life. On Saturday evening, His Grace arrived to the St. Sava Parish where he was greeted by approximately 15-20 children and 50 adults. After the Vespers Service (served by Fr. Serafim and Deacon Basil Hinkley), Father Predrag greeted His Grace in behalf of the whole community and reminded people of the Episcopal role in the Church. Fr. Predrag spoke on behalf of the whole synaxis when he expressed his gratitude to His Grace for his sacrificial love, prayers, and guidance, emphasizing the fact that sacrificial love changes everything and with hopes that His Grace’s love will motivate us, his sons and daughters, to a much needed change, as we embark on a blessed journey towards Golgotha and Pascha. Afterwards dinner took place in the church hall where the local KSSmembers served a delicious meal. After this delicious dinner and a short performance of the youngest members of the Parish, His Grace delivered an inspiring and spiritually edifying lecture on the topic of “How to overcome the passion of self-love.” Then, with the liberty typical of children with their parents, sons and daughters of this region engaged in a spiritually uplifting conversation with their father, His Grace Bishop Maxim, raising many questions of great importance for their salvation. These refreshing talks lasted late into the evening when, prior to adjourning, Fr. Predrag expressed gratitude to His Grace and invited everyone to participate in tomorrow’s Divine Liturgy, thus making manifestThe Future Reality and continuing our journey towards “The Never Ending Day“ of the Lord’s Kingdom, gathered around our Father and Bishop Maxim. On Sunday morning, upon His Grace’s arrival and vesting, and at “The Small Entrance”, Fr. Predrag was elevated by His Grace Bishop Maxim into the rank of a Protopresbyter and then His Grace presided over a solemn Eucharistic Synaxis. More than 100 adults and 40 children came in thirst for “The Living Water”, of whom many quenched this spiritual thirst by communing in the Cup of Eternal Life. Laughter, joy and music filled the hall during the festal banquet (again prepared by our KSS Sisters) as His Grace alternated time between enjoyable conversations with adults and happy playing with the children who sought his attention. Then, our Sunday school children pleasantly surprised everyone with their performance comprised of singing, playing (our parish’s youth band), and dancing. Seeing His Grace and Prota Lazar off at the airport, filled with emotions and memories of the few memorable and joyful days in His Grace’s presence, Fr. Predrag on behalf of the “Holy ones” of this community, and “with one heart and one mind” with them proclaimed: IS POLA ETI DESPOTA!